Continuation from the previous 59 parts, the whole series can be found at http://www.nikoport.com/columnstore/. This blog post is dedicated to some of the major improvements in SQL Server 2016, related to the Batch Execution Mode. By all means this list is not complete, I have already written about Batch Mode improvements in SQL Server 2016 previously – see Columnstore Indexes – part 59 (“Aggregate Pushdown”), Columnstore Indexes – part 58 (“String Predicate Pushdown”) & of course in Columnstore Indexes – part 54 (“Thoughts on upcoming improvements in SQL Server 2016”). As I have already suspected and discovered in December of 2014, the current Azure offering has offered support for a Single Core Batch Execution Mode support already, and now with upcoming SQL Server 2016, we have an official & public confirmation that Microsoft will be supporting Batch Execution Mode for a single core. This is one of the major and most long-awaited items on any Columnstore Index specialist list. This means much better predictability of the query execution times on the real servers, that are being suffering with the lack of memory, since as everyone should know, memory pressure lowers the available degree of parallelism. For testing in this case I have chosen a SQL Server 2016 CTP 2.0, since CTP 2.1 has some major regressions in the are of Batch Execution Mode. You should easily see the differences between the plans, with Row Execution Mode going for the Merge Join and naturally sorting the Hash Match output in order to get less resources consumed – the difference in memory grants is quite impressive. 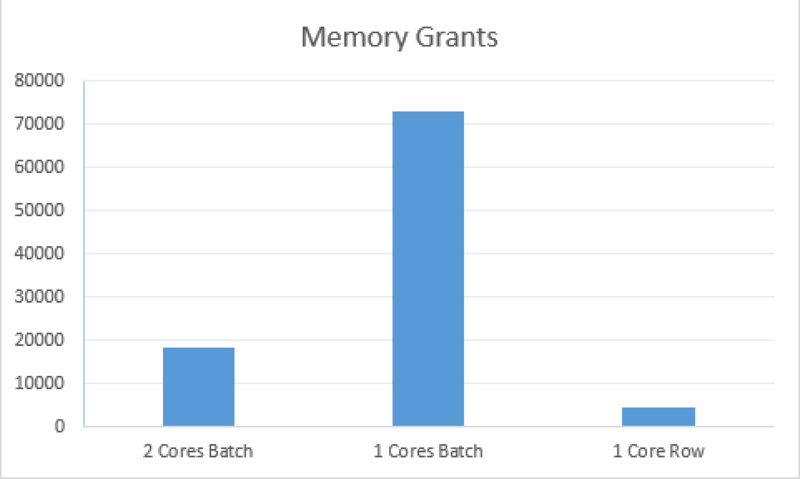 Looking at the results of the Memory Grants, I can’t stop wondering if there are some miscalculations for the Batch Mode involving 1 core. I imagine that right now it is more a kind of a “playing safe” mode, since we are still quite deep into the beta-versions of software, but still we are talking about 4 times bigger memory grant for a query, that uses just 2 times less cores. I hope the memory consumption will get improved in the further versions of SQL Server 2016 before RTM, I have seen a number of troubles with the Memory Spill’s for a single core, and so I can imagine that higher memory consumption is a kind of safe haven for getting almost guaranteed performance, but we all know that having a lot of big memory-hungry queries leads resource semaphore to suspend them quite fast, which is definitely is an opposite of what we are hoping to achieve. 1. CPU time =  281 ms,  elapsed time =  242 ms.
2. CPU time =  281 ms,  elapsed time =  385 ms.
3. CPU time = 3203 ms,  elapsed time = 3365 ms. I have shown enough times in my presentations the difference between having Batch Execution Mode and having Row Execution Mode for Columnstore Indexes, and this is one more examples that shows that the true difference lies exactly in the way that the data is being processed. 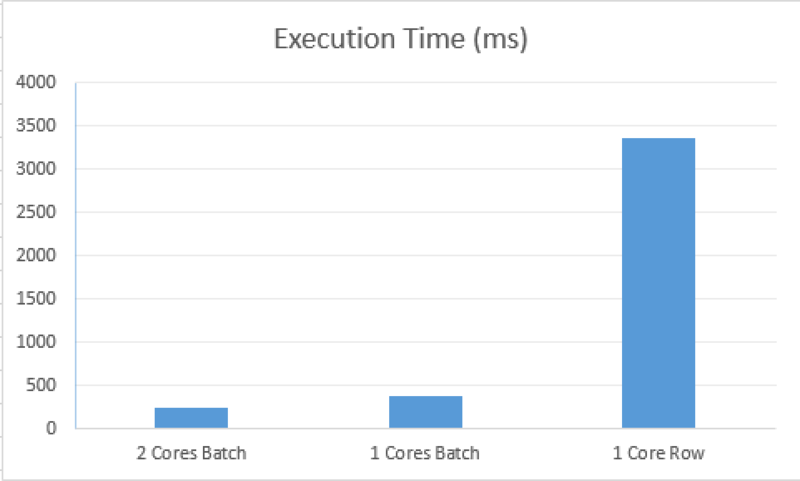 One would expect some Row Execution Mode to finish in under 1 second, but as a matter of a fact it takes almost 10 times more than the equal (1 core) Batch Execution Mode. As for the difference between the execution times of the 2 cores vs 1 core Batch Execution Mode, here we clearly deal with the percentage of time improvement that was spent in the Batch Mode. Single Core Batch Execution Mode is a very important improvement for the Columnstore Indexes, especially for the Operational Analytics it will make a huge impact, but there are definitively things to improve before the final release of SQL Server 2016. One of the key operators that was not supporting Batch Mode in SQL Server 2014 was the Sort, and in SQL Server 2016 Microsoft team has finally implemented some support for it. 1. (Batch Mode): CPU time =  406 ms,  elapsed time = 203 ms.
2. 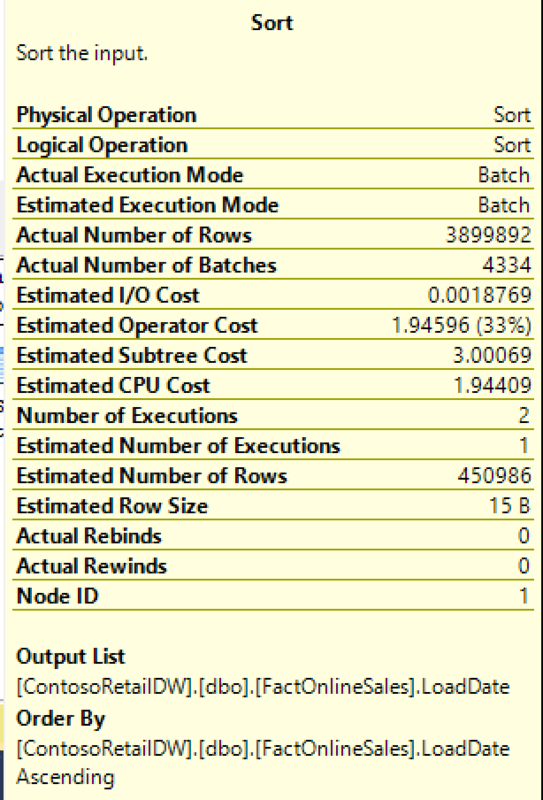 (Row Mode)  : CPU time = 2344 ms,  elapsed time = 1895 ms.
Should we include a TOP X into our T-SQL statement, where X is below some certain percentage, then we are getting our SORT operator back into the Row Execution Mode. I can only conclude from my tests that it has to do with TempDB spilling or simply having way too few rows where Batch Mode would not bring any improvement at all (sorting 5 rows for example does not make sense to do in Batch Execution Mode). You can see from the execution plan above that our SORT operator has spilled into TEMPDB because of not having enough resources. This has pushed our SORT operator into Row Execution Mode. I can only hope that Spilling into TempDB while sorting data will receive Batch Execution Mode improvement, we have received Hash Table Spill support for Batch Execution Mode in SQL Server 2014 and this implementation for Sorting should not be anywhere near impossible. A very common query for an analytical queries is to have multiple distinct count operations within a single query. In SQL Server 2012 & SQL Server 2014 those types of queries were painfully slow, because of the issues in the implemented execution plan – no one likes to see Eager Spools if they are not truly necessary. Let’s run the following test query on the SQL Server 2016 CTP 2.1 & on SQL Server 2014 SP1, to see if there is some measurable difference in the actual performance. 1. SQL Server 2016:   CPU time =    94 ms,  elapsed time =   113 ms.
2. SQL Server 2014:   CPU time = 14218 ms,  elapsed time = 13483 ms. The implementation in SQL Server 2016 is quite simple, simply hashing the received information and determining count of distinct values directly without resorting to expensive temporary storage in order to scan that temporary storage multiple times. I am confident that a lot of people shall benefit this feature and looking back at SQL Server 2014 & 2012 people will wonder about the reasons that prevented this feature to be implemented right away in SQL Server 2012. I imagine this simply has to do with the resources and time that the development team has, and the fact that we are getting improved versions of Columnstore Indexes & Batch Execution Mode proves that the problem is not with the capability but with capacity. Well, that’s perfect, you might say … But are there any gotchas ? 1. SQL Server 2016:   CPU time = 11125 ms,  elapsed time = 11253 ms.
2. SQL Server 2014:   CPU time = 10374 ms,  elapsed time =  9772 ms.
Let me assure you that Microsoft knows about this missing functionality and I really hope that they will fix it before RTM. Overall some great improvements for the Batch Execution Mode, with some very useful improvements but also some important bugs to fix. From my point of view, there are no reasons to stress about the bugs, since this test is still based on a very early preview version of the software. Seems that the limitation of having a GROUP BY in a multiple COUNT DISTINCT query has been lifted in RTM (or at least in SP1). yeap. There are constant changes and improvements and I simply can’t keep up updating every single blog post. Thank you for pointing that this feature was improved. To my memory it was already in the RC branch. Regarding COUNT DISTINCT over a BIT field – I guess that this functionality is simply not implemented by the engine, but given that the solution (casting or changing data type) is so easy in the most cases – this is not a priority right now. By the way, given effectiveness of the Columnstore compression I am actually thinking if there will be really some difference of storing 0 & 1 in BIT vs TinyINT. I expect them to be equally big.